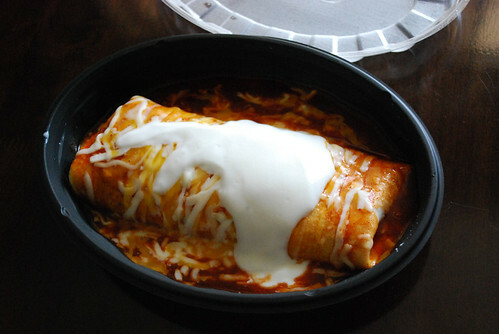 I’m one of those guys who didn’t believe there was such a thing as a “wet burrito.” Opposed to what, a “dry burrito?” The first time I ever heard of such a thing was in 1982 from an old guy in the Midwest who said “the wet burritos are terrific” at this one Mexican restaurant in Indiana. Being from the West, I just rolled my eyes because I’d eaten many a burrito from many a Mexican restaurant and I knew KNEW there was no such animal. Like the coelacanth, apparently there are such things as “wet burritos.” Furthermore, they exist here in California in this day and age. And Taco Bell has it. 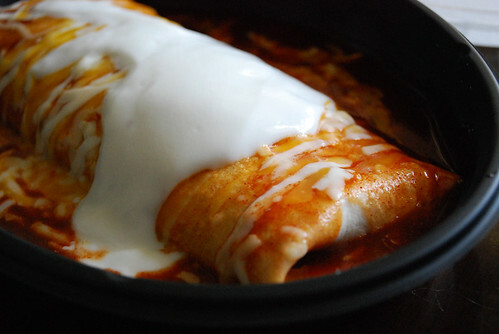 Dubbed the “Smothered Burrito,” what you get is a burrito — beef, shredded chicken or steak, along with seasoned rice and beans, a chipolte cream sauce, all wrapped in a flour tortilla — and covered with shredded cheddar cheese and a warm, red enchilada sauce. Atop the whole thing is a generous dollop of sour cream. 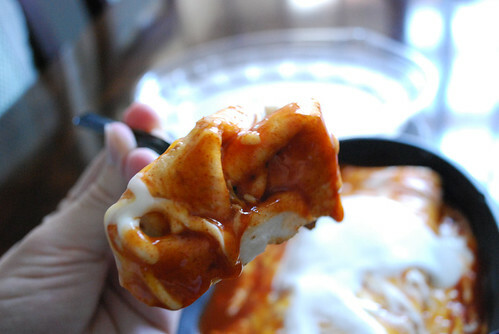 The sauce does a good job of melting the cheese so by time you’re ready to dig in, it’s a gooey ordeal. 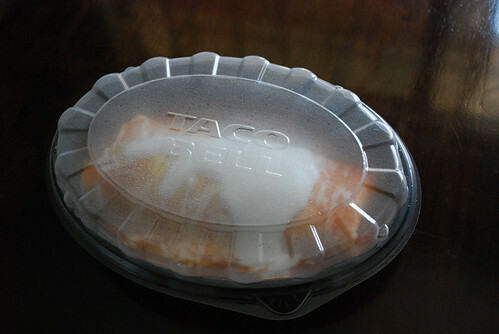 The smothered burrito is served in a plastic “to-go” container with a lid. I think this might be the first Taco Bell entree that is practically impossible to eat while driving. There is no elegant way to eat this other than with a knife and fork (provided). Make no mistake— this is a meal. I was able to cut this up into about 9-10 decent-sized bites, each with plenty of sauce and sour cream. It was tasty and filling, and a bit on the spicy side (no hot sauce needed). Darlene joked “I wonder if that’s how they get rid of old burritos.” That got me wondering, too… but I know Taco Bell makes their burritos from scratch and this one was no exception. Twenty minutes later, I was full. Good job, Taco Bell. Now here’s the bad news: the Smothered Beef Burrito weighs in at a whopping 780 calories, with 320 of those calories coming from fat. The shredded chicken and steak varieties have fewer calories, but not by much. 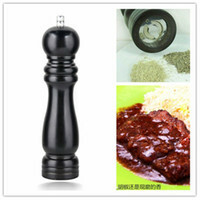 It’s also a sodium bomb with 2260 mg — more than any other single item on their menu. If you’re going to eat one of these, choose your other meals wisely. The Smothered Beef Burrito costs $3.69; chicken and steak varieties cost a bit more. It’s available for a limited time and at participating Taco Bell locations. One of my co-workers had this the other day. His “wet” burrito was the source of a few gross jokes during lunch. Seriously though, he liked it. I ended up with a couple of crunchy tacos, the cheapo ones.